Mormon scholars and apologists respond to the anachronisms in several ways. The list below summarizes the most prominent anachronisms, as well as perspectives of Mormon scholars and common apologetic rebuttals. 4.5.2 Metal swords, which had "rusted"
According to Joseph Smith, the Book of Mormon was originally engraved on golden plates, which he received in 1827 from an angel named Moroni, whom Smith identified as a resurrected former inhabitant of the American continent. Smith claimed to translate the original text of the plates into English; the book says that the text was written on the plates in "reformed Egyptian". The Book of Mormon is said to have taken place somewhere in the Americas from c. 2500 BC to 400 AD, thus placing its events within the pre-Columbian era. Critics claim that the book's origin lies firmly in the 19th century and that Smith created it with the resources available to him, including the King James Version (KJV) of the Bible. 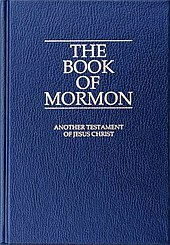 Unlike the Bible, no manuscripts in the supposed original language of the Book of Mormon are known to exist. No Reformed Egyptian manuscripts or plates have ever been excavated by archaeologists. Critics and supporters disagree as to whether other archaeological findings support or disprove the historicity of the Book of Mormon. Some Mormon archaeologists and researchers claim various archaeological findings such as place names, and ruins of the Inca, Maya, Olmec, and other ancient American and Old World civilizations as giving credence to the Book of Mormon record. Book of Mormon prophets quote chapters 48 through 54 of the Book of Isaiah after having left Jerusalem around 600 BC. Since Isaiah died around 698 BC, under traditional biblical belief, there would be no conflict. However, modern biblical scholars assert that these chapters were not written by Isaiah, but rather by one or more other people during the Babylonian captivity, sometime between 586 and 538 BC (between 14 and 82 years after it could have been known to the Book of Mormon prophets). Baptism is mentioned as a ritual that is taught and performed among the Nephite civilization, with its first mention being taught by Nephi between 559 and 545 BC. However, baptism as a part of conversion was not customary until after the Babylonian captivity, which ended decades after the practice was ostensibly taught and practiced as related in the Book of Mormon. A practice similar to baptism is known to have been practiced by the Jewish Essenes between the 2nd century BC and the 1st century AD. The Jewish Encyclopedia compares Christian baptism to ancient Jewish purification and initiation rites involving immersion in water, and states that "Baptism was practised in ancient (Hasidic or Essene) Judaism". Horses are mentioned 14 times in the Book of Mormon, and are portrayed as an integral part of the cultures described. There is no evidence that horses existed on the American continent during the timeframe of the Book of Mormon. Horses evolved in North America, but are believed to have become extinct on the American continent at the end of the Pleistocene. Horses did not reappear in the Americas until the Spaniards brought them from Europe. They were brought to the Caribbean by Christopher Columbus in 1493, and to the American continent by Hernán Cortés in 1519. Apologists assert that there is evidence that some New World horses may have survived the Pleistocene–Holocene transition, and that such evidence is accepted by some non-Mormon scholars. Others believe that the word "horse" in the Book of Mormon does not refer to members of the genus Equus but instead to other animals such as deer or tapirs. FARMS apologist Robert R. Bennett stated that as a comparison, the famed horses of the Huns did not leave any archaeological trace yet numbered in the thousands. Archaeological remains of horses have been found at the Hun sites of Boroo Gol, Mankhan as well as at various grave sites directly preceding the Huns. Bennett also draws an analogy by discussing the limited evidence of "lions" in Palestine: "The biblical narrative mentions lions, yet it was not until very recently that the only other evidence for lions in Palestine was pictographic or literary. Before the announcement in a 1988 publication of two bone samples, there was no archaeological evidence to confirm the existence of lions in that region." Elephants are mentioned in the Book of Ether. Critics maintain that there is no evidence of elephants in the Americas after the end of the Pleistocene. Elephants are mentioned twice in a single verse in the Book of Ether. Mastodons and mammoths lived in the New World during the Pleistocene; however, as with the prehistoric horse, the fossil record indicates that they became extinct along with most of the megafauna towards the end of the last ice age. The source of this extinction, known as the Holocene extinction is speculated to be the result of human predation, a significant climate change, or a combination of both factors. It is known that a small population of mammoths survived on Saint Paul Island, Alaska, up until 5725 BP, but this date is more than 1000 years before the Jaredite record in the Book of Mormon begins. Various Mormon authors have cited evidence that North American mound-builder cultures were familiar with the elephant. The oldest mound-builder societies date to around 2000 BC. The mound builder/elephant controversy did not originate with the Book of Mormon. In The Mound Builders, Their Works and Relics, author Stephen Dennison Peet cites instances of exhumed mastodon remains and arguments given for why the remains were believed to be contemporary with mound builders. Elephant effigy pipes, of the characteristic mound builder platform style, were reported as archaeological finds in Iowa, and many have readily identified the animal depicted in the shape of the Wisconsin "elephant mound", though others question whether this is in fact the animal represented. The former Iowa state archaeologist Marshall McKusick discusses the evidence indicating that the elephant platform pipes are frauds in his book on the so-called Davenport Tablets. The co-existence of man and elephantine animals is congruent with the archaeological record, but does not address the anachronism, since the dates of all elephantine remains have been placed well before their mention in the Book of Mormon. There are instances of stories preserved orally by Native Americans which some Mormon scholars believe may describe elephants. One such story is related by the Naskapi Indian Tribe, located in eastern Quebec and the Labrador region of Canada. The story concerns a monster from the Naskapi tradition called "Katcheetohuskw", which is described as being very large, with large ears, teeth and a long nose. Similar versions of "monster" legends related by other tribes refer to a monster called "Ursida", which is described as more of a large, stiff-legged bear rather than a mammoth. The story of the "monster bear" is considered by some scholars to be purely mythical. Delaware and other native American legends of the mastodon are likewise said to exist. There are six references to "cattle" in the Book of Mormon, including verbiage suggesting they were domesticated. Critics argue that there is no evidence that Old World cattle (members of the genus Bos) inhabited the New World prior to European contact in the 16th century AD. Apologists argue that the term "cattle" may be more generic than suggesting members of the genus Bos, and may have referred to bison, mountain goats, llamas, or other American species. According to the Book of Mormon, "cattle" could be found in ancient America. Without these, the Nephites could not have kept the Law of Moses, as directed. However, no species of bison is known to have been domesticated. "Goats" are mentioned three times in the Book of Mormon placing them among the Nephites and the Jaredites. In two of the verses, "goats" are distinguished from "wild goats" indicating that there were at least two varieties, one of them possibly domesticated. Domesticated goats are not native to the Americas, having been domesticated in pre-historic times on the Eurasian continent. Domesticated goats are believed to have been introduced on the American continent upon the arrival of the Europeans in the 15th century, 1000 years after the conclusion of the Book of Mormon, and nearly 2000 years after they are last mentioned in the Book of Mormon. The mountain goat is indigenous to North America and has been hunted, and the fleece used for clothing. However it has never been domesticated, and is known for being aggressive towards humans. Roper based his arguments on anecdotes from early Spanish colonists which called native Mesoamerican brocket deer goats: "Friar Diego de Landa noted, 'There are wild goats which the Indians call yuc.'" He quoted another friar in the late 16th century, "in Yucatán 'there are in that province ... great numbers of deer, and small goats'". However, Yale anthropologist Marion Schwartz noted that in the Americas "The white-tailed deer is a good example of an animal whose solitary behavior precludes its domestication even though it prefers to live in areas that people have opened up. Deer have been tamed and herded but not truly domesticated." "Swine" are referred to twice in the Book of Mormon, and the narrative of the Book of Mormon suggests that the swine were domesticated by the Jaredites. There have not been any remains, references, artwork, tools, or any other evidence suggesting that swine were ever present in the pre-Columbian New World. Apologists note that peccaries (also known as javelinas), which bear a superficial resemblance to pigs, have been present in South America since prehistoric times. Mormon authors advocating the original mound-builder setting for the Book of Mormon have similarly suggested North American peccaries (also called "wild pigs") as the "swine" of the Jaredites. B. H. Roberts noted, however, that peccaries have never been domesticated. Grains are mentioned 28 times in the Book of Mormon, including "barley" and "wheat". The introduction of domesticated modern barley and wheat to the New World was made by Europeans sometime after 1492, many centuries after the time in which the Book of Mormon is set. Research on this matter supports two possible explanations. First, the terms barley and wheat, as used in the Book of Mormon, may refer to certain other New World crop plants that were given Old World designations; and second, the terms may refer to genuine varieties of New World barley and wheat. For example, the Spanish called the fruit of the prickly pear cactus a "fig," and emigrants from England called maize "corn," an English term referring to grains in general. A similar practice may have been employed when Book of Mormon people encountered New World plant species for the first time. Bennett also postulates that references to "barley" could refer to Hordeum pusillum, also known as "little barley", a species of grass native to the Americas. The seeds are edible, and this plant was part of the pre-Columbian Eastern Agricultural Complex of cultivated plants used by Native Americans. Hordeum pusillum was unknown in Mesoamerica, where there is no evidence of pre-Columbian barley cultivation. Evidence exists that this plant was domesticated in North America in the Woodland periods contemporary with mound-builder societies (early centuries AD) and has been carbon-dated to 2,500 years ago. Barley samples that date to 900 AD were also found in Phoenix, Arizona, and samples from Southern Illinois date between 1 and 900 AD. The Book of Mormon mentions the use of "chariots" as a mode of transportation five times. There is no archaeological evidence to support the use of wheeled vehicles in pre-Columbian Mesoamerica. Many parts of ancient Mesoamerica were not suitable for wheeled transport. Clark Wissler, the Curator of Ethnography at the American Museum of Natural History in New York City, noted: "we see that the prevailing mode of land transport in the New World was by human carrier. The wheel was unknown in pre-Columbian times." A broader claim that wheels did not exist in pre-Columbian Mesoamerica is incorrect. Wheels were used in a limited context in Mesoamerica for what were probably ritual objects, "small clay animal effigies mounted on wheels. Lack of suitable draft animals and a terrain unsuitable for wheeled traffic are the probable reasons that wheeled transport was never developed." A comparison of the South American Inca civilization to Mesoamerican civilizations shows the same lack of wheeled vehicles. Although the Incas used a vast network of paved roads, these roads are so rough, steep, and narrow that they were likely unsuitable for wheeled use. Bridges that the Inca people built, and even continue to use and maintain today in some remote areas, are straw-rope bridges so narrow (about 2–3 feet wide) that no wheeled vehicle can fit. Inca roads were used mainly by chaski message runners and llama caravans. Mayan paved roads at Yucatan had characteristics which could allow the use of wheeled vehicles, but there is no evidence that those highways were used by other than people on foot and nobles who were borne on litters. Charnay obtained from an ancient cemetery at Tenenepanco, Mexico, a number of toy chariots of terra cotta, presumably buried with the body of a child, some of which retained their wheels. The possibility that these toys are of a post-discovery manufacture must be taken into account, especially since mention is made of the discovery of brass bells in the same cemetery with the toys. One Mormon researcher responds to the lack of evidence with a comparison to biblical archaeology, suggesting that though there are no archaeological evidences that any of the numerous ancient American civilizations used wheeled transportation, few chariot fragments have been found in the Middle East dating to biblical times (apart from the disassembled chariots found in Tutankhamun's tomb). Although few fragments of chariots have been found in the Middle East, there are many images of ancient chariots on pottery and frescoes and in many sculptures of Mediterranean origin, thus confirming their existence in those societies. Chariots are absent in pre-Columbian frescoes, pottery and artwork found in the New World. Referencing the discovery of wheeled chariot "toys" in Mayan funerary settings, Mormon scholar William J. Hamblin has suggested that the "chariots" mentioned in the Book of Mormon might refer to mythic or cultic wheeled vehicles. The Book of Mormon mentions the use of "silk" in the New World four times. "Silk" is generally understood[by whom?] to refer to material that is created from the cocoon of one of several Asian moths, predominantly Bombyx mori; this type of silk was unknown in pre-Columbian America. Mormon scholar John L. Sorenson documents several materials which were used in Mesoamerica to make fine cloth equivalent to silk, some of which the Spanish actually called "silk" upon their arrival, including the fiber (kapok) from the seed pods of the ceiba tree, the cocoons of wild moths, the fibers of silkgrass (Achmea magdalenae), the leaves of the wild pineapple plant, and the fine hair of the underbelly of rabbits. He alleges that the inhabitants of Mexico used the fiber spun by a wild silkworm to create a fabric. The Aztecs used a silk material taken from nests made by two indigenous insects, the moth Eucheira socialis and the butterfly Gloveria psidii. The nests were cut and pieced together to make a fabric, rather than extracting and spinning the fiber as in modern silk. Spinning of silk from what are thought to be the same insects has been reported in more recent times, though its use in pre-Columbian times has been debated. The Book of Mormon also states that a "compass" or "Liahona" was used by Nephi in the 6th-century BC. The compass is widely recognized to have been invented in China around 1100 AD, and remains of a compass have never been found in America. In the Book of Alma, Alma explains to his son that "our fathers called it Liahona, which is, being interpreted, a compass". Apologists counter that Liahona was, according to the narrative, created by God, and not by the Nephites. Also, unlike a normal compass, the Book of Mormon says that there was also writing on the ball that displayed instructions from God, and there was no mention of any part of it pointing to a geographic point. Recent speculation has raised the possibility of the Liahona being a form of astrolabe which are indicated to have existed during Lehi's time frame. The Book of Mormon describes that the Jaredite people were familiar with the concept of "windows" near the time of the biblical Tower of Babel, and that they specifically avoided crafting windows for lighting in their covered seagoing vessels, because of fears that "they would be dashed in pieces" during the ocean voyage. Transparent window panes are a more recent invention, dating to the 11th century AD in Germany. The earliest known production of glass dates to 3500 BC in Egypt and Mesopotamia, though the specimens are non-transparent beads. FairMormon notes that 'the term "window" originally referred to an opening through which the wind could enter', citing several such uses in the King James Version of the Bible, and suggests that the warning in Ether may have referred to the entire vessel being "dashed in pieces" if the structure was weakened by additional openings. The Book of Mormon mentions a number of metals, and the use of metal. However, while pre-Columbian tribes used metal, often beaten, there is no accepted evidence of high-temperature melting. The word "dross" appears twice in the Book of Alma. In addition to meaning a by-product of smelting, it can also mean "waste matter; refuse; any worthless matter separated from the better part; impure matter." Thus, use of the word dross does not necessarily imply the melting of metal but may be consisting with low temperature working of metal to eliminate inclusions or surrounding gangue material. The Book of Mosiah also mentions "ziff" as a metal, but its modern correlate is unknown. "Steel" and "iron" are mentioned several times in the Book of Mormon. Even though ancient Andean people smelted some metals, such as copper, they never smelted iron like they did in the Old World .... Metals were used for a variety of tools in the Old World, such as weapons, while in the Americas, metals were used as prestige goods for the wealthy elite. Apologists counter that the word "steel" may be referring to another alloy of hardened metal such as the hardened copper alloy that is translated with the word "steel" in the KJV. This alloy is in fact a hardened copper similar to bronze and not hardened iron. Metal swords, which had "rusted"
The Book of Mormon makes numerous references to "swords" and their use in battle. What the swords are made of is mostly ambiguous except for two instances involving the Jaredites. The first was an early battle involving Shule which used "steel" swords. When the remnants of the Jaredite's final battle were discovered, the Book of Mormon narrative states that "the blades thereof were cankered with rust," suggesting that these swords were also metal. Though usually more resistant to oxidation than iron, copper alloys are susceptible to bronze disease in humid conditions and hardened alloys of copper can oxidize. It is therefore not certain that the mention of "rust" is a reference to iron oxide. Warriors in pre-Columbian Mesoamerica are known to have used wooden clubs with blade-like obsidian flakes; as a volcanic glass, obsidian does not rust. The closest evidence to a pre-Columbian metal blade on Mesoamerica come from the Maya, but those artifacts were not swords, but small copper axes used as tools. "Cimiters" are mentioned about ten times in the Book of Mormon. The word "cimiter" is considered an anachronism, since the word was never used by the Hebrews or any other civilization prior to 450 AD. There is no evidence that native American peoples used scimitar blades. Apologists, including Michael R. Ash, and William Hamblin of FAIR, note that the Book of Mormon does not mention the materials that the "cimiters" were made out of, and postulate that the word was chosen by Joseph Smith as the closest workable English word for the weapon used by the Nephites that was not made of metal, and was short and curved. The Book of Mormon account refers to various groups of literate peoples, at least one of which is described as using a language and writing system with roots in Hebrew and Egyptian. Fifteen examples of distinct scripts have been identified in pre-Columbian Mesoamerica, many from a single inscription. Archaeological dating methods make it difficult to establish which was earliest (and hence the forebear from which the others developed) and a significant portion of the documented scripts have not been deciphered. None of the documented Mesoamerican language scripts have any known relation to Hebrew or Egyptian. The Book of Mormon describes another literate culture, the Jaredites, but does not identify the language or writing system by name. The text that describes the Jaredites (Book of Ether) refers only to a language used prior to the alleged confounding of languages at the great tower, presumably a reference to the Tower of Babel. Linguistic studies on the evolution of the spoken languages of the Americas agree with the widely held model that the initial colonization of the Americas by Homo sapiens occurred over 10,000 years ago. FairMormon apologists argue that the Book of Mormon does not describe all of the original settlers of the Americas, but rather a subset of the larger population, who settled in a limited geographical setting. Thus, their language and writing may have had little to no impact on the culture of the rest of the population. The words "Christ" and "Messiah" are used several hundred times throughout the Book of Mormon. The first instance of the word "Christ" in the Book of Mormon dates to between 559 and 545 BC. The first instance of the word "Messiah" dates to about 600 BC. "Christ" is the English transliteration of the Greek word Χριστός (transliterated precisely as Christós); it is relatively synonymous with the Hebrew word rendered "Messiah" (Hebrew: מָשִׁיחַ, Modern: Mashiaẖ, Tiberian: Māšîăḥ). Both words have the meaning of "anointed," and are used in the Bible to refer to "the Anointed One". In Greek translations of the Old Testament (including the Septuagint), the word "Christ" is used for the Hebrew "Messiah", and in Hebrew translations of the New Testament, the word "Messiah" is used for the Greek "Christ". Any usage in the Bible of the word "Christ" can be alternately translated as "Messiah" with no change in meaning (e.g. Matthew 1:1, 16, 18). And after he had baptized the Messiah with water, he should behold and bear record that he had baptized the Lamb of God, who should take away the sins of the world." (1 Nephi 10:10). The word "Messiah" is used in the text before this point, but from this point on the word "Christ" is used almost exclusively. Richard Packham argues that the Greek word "Christ" in the Book of Mormon challenges the authenticity of the work since Joseph Smith clearly stated that, "There was no Greek or Latin upon the plates from which I, through the grace of the Lord, translated the Book of Mormon." The Foundation for Apologetic Information & Research states that the word "Christ" is the Greek equivalent of the Hebrew word "Messiah" and that Smith simply chose the more familiar Greek word to translate the word that appeared in the language of the plates. Hugh Nibley postulated that the word "Messiah" could have been derived from Arabic rather than Hebrew, although Arabic is not mentioned as one of the languages in which the golden plates were written. Joseph Smith stated in a letter to the editor of Times and Seasons, "There was no Greek or Latin upon the plates from which I, through the grace of the Lord, translated the Book of Mormon." The Book of Mormon contains some names which appear to be Greek, some of which are Hellenizations of Hebrew names (e.g. Antipas, Archeantus, Esrom, Ezias, Jonas, Judea, Lachoneus and Zenos). Other Greek names are non-biblical and their presence in the book is puzzling to both believers and skeptics, since neither Smith nor the Nephites spoke Greek. One explanation has been offered by Stephen D. Ricks. Writing in the LDS magazine Ensign he said that though the language of the Mulekites is not put forward in the Book of Mormon, the party could have included Phoenicians who had regular contact with the Greeks or perhaps some Greek sailor or traders were also in the initial group. In addition, Greek names have occurred as loan names in ancient Hebrew. And he [Laban's servant], supposing that I spake of the brethren of the church, and that I was truly that Laban whom I had slain, wherefore he did follow me (1 Nephi 4:26). According to the Book of Mormon, this exchange happened in Jerusalem, around 600 BC. The meaning of the word "church" in the Book of Mormon is more comparable to usage in the KJV than modern English. The concept of a church, meaning a convocation of believers, existed among the House of Israel prior to Christianity. For instance, Psalms 89:5 speaks of praising the Lord "in the congregation of the saints"; the Septuagint contains the Greek word "ecclesia" for "congregation," which is also translated as "church" in the New Testament. The Book of Mormon using the word "church" in the same "style" as the KJV is seen by some apologists as support for the Book of Mormon. And Alma and Amulek went forth preaching repentance to the people in their temples, and in their sanctuaries, and also in their synagogues, which were built after the manner of the Jews (Alma 16:13). Scholars note that synagogues did not exist in their modern form before the destruction of the temple and the Babylonian captivity. The oldest known synagogue is located in Delos, Greece, and has been dated to 150 BC. Critics Jerald and Sandra Tanner and Marvin W. Cowan contend that certain linguistic properties of the Book of Mormon provide evidence that the book was fabricated by Joseph Smith. These critics cite linguistic anachronisms such as the Americanized name "Sam" (1 Nephi 2:5,17). Apologists assert that it is potentially a hypocoristicon from Samuel representing the common Semitic vocable šm and would most likely mean “the name,” “Name,” or even “descendant/offspring" among other Near Eastern linguistic possibilities. The French word "adieu" appears once in the Book of Mormon, in Jacob 7:27. Supporters of the Book of Mormon argue that the text is a translation into modern English, so the use of a French word is not amiss. For example, Daniel H. Ludlow contends that it may have been the result of Joseph Smith choosing the best word available to convey the meaning of the original text. The word is found in the 1828 Webster's Dictionary so was considered an English word at the time of the Book of Mormon translation. A significant portion of the Book of Mormon quotes from the brass plates, which purport to be another source of Old Testament writings mirroring those of the Bible. In many cases, the biblical quotations in the English-language Book of Mormon, are close, or identical to the equivalent sections of the KJV. Critics consider several Book of Mormon anachronisms to originate in the KJV. Other English-language versions of the Bible, including the New International Version, translate the word שעיר (sa`iyr) as "wild goat"; other translations include "monkey" and "dancing devil". ^ Smith (1838, pp. 42–43). ^ "LDS chapter headings to the Book of Isaiah". lds.org. 2012-02-21. Retrieved 2012-06-11. ^ 2 Nephi 9:23 "And he commandeth all men that they must repent, and be baptized in his name". ^ "Notes on the Bible by Albert Barnes: Matthew: Matthew Chapter 3". www.sacred-texts.com. Retrieved 2018-03-15. ^ "Religion: Out of the Desert". Time. 1957-04-15. ^ "BAPTISM - JewishEncyclopedia.com". jewishencyclopedia.com. Retrieved 2018-03-15. ^ Alma 18:9, Alma 18:12, Alma 20:6, 3 Nephi 3:22. ^ R.J.G. Savage & M.R. Long, Mammal evolution, an illustrated guide (1986, Facts on File, p. 202): "although the true horses had themselves also by then died out in Europe and Asia, they survived in North America and from there they continued to evolve." ^ Guthrie, R. Dale. "Rapid body size decline in Alaskan Pleistocene horses before extinction". Nature. Retrieved 2006-12-10. ^ Baker, Barry W.; Collins, Michael B.; Bousman, C. Britt. "Late Pleistocene Horse (Equus sp.) from the Wilson-Leonard Archaeological Site, Central Texas" (PDF). Retrieved 2011-02-20. ^ Kirkpatrick, Jay F.; Fazio, Patricia M. "Wild Horses as Native North American Wildlife". Archived from the original on 2006-11-29. Retrieved 2006-12-10. ^ Singer, Ben. "A brief history of the horse in America; Horse phylogeny and evolution". Canadian Geographic Magazine. Archived from the original on 2014-08-19. Retrieved 2009-10-30. ^ See Ray, Clayton E. (May 1957). "Pre-columbian Horses from Yucatan". Journal of Mammalogy. 58 (2): 278. doi:10.2307/1376338. JSTOR 1376338. and references cited therein; see also other references cited in John L. Sorenson, An Ancient American Setting for the Book of Mormon (Salt Lake City, Utah: Deseret Book, 1996), 295, n.63. ^ a b "Book of Mormon/Animals/Horses - FairMormon". www.fairmormon.org. Retrieved 2017-10-11. ^ Bennett, Robert R. "Horses in the Book of Mormon". Maxwell Institute. Brigham Young University. Archived from the original on 2008-06-11. Retrieved 2008-08-30. ^ "Reexploring the Book of Mormon". Neil A. Maxwell Institute for Religious Studies. Retrieved 2015-03-05. ^ Robert R. Bennett. "Reexploring the Book of Mormon". Neil A. Maxwell Institute for Religious Scholarship. Retrieved 2015-03-05. ^ Denis Ramseyer; Nicole Pousaz; Tsagaan Torbat. "THE XIONGNU SETTLEMENT OF BOROO GOL, SELENGE AIMAG, MONGOLIA". Academia.edu. Retrieved 2014-06-25. ^ Mongolia Today. "Hun Princess Graveyard's Secret". Mongolia Today. Archived from the original on 2012-03-26. Retrieved 2014-06-25. ^ Higham, Charles F. W. ""Xiongnu." Encyclopedia of Ancient Asian Civilizations". Facts On File, Inc. Retrieved 2014-06-25. ^ Ether 9:19 "And they also had horses, and asses, and there were elephants". ^ Enk, J. M.; Yesner, D. R.; Crossen, K. J.; Veltre, D. W.; O'Rourke, D. H. (2009). "Phylogeographic analysis of the mid-Holocene Mammoth from Qagnaxˆ Cave, St. Paul Island, Alaska". Palaeogeography, Palaeoclimatology, Palaeoecology. 273: 184–190. doi:10.1016/j.palaeo.2008.12.019. ^ Dickie, Gloria (July 16, 2014). "Ancient Native Americans Ate Pachyderms; Site Challenges Theory of Where New World Culture Began". ^ "Book of Mormon anachronisms: Elephants". ^ Johnson, Ludwell H III (October 1952). "Men and Elephants in America". Scientific Monthly: 215–21. Johnson states that the stories claimed that the monster was "very large, had a big head, large ears and teeth, and a long nose with which he hit people." ^ Siebert, F. T. Jr (October–December 1937). "Mammoth or "Stiff-Legged Bear"". American Anthropologist. 39 (4): 721–25. doi:10.1525/aa.1937.39.4.02a00410. ^ D.L. Johnson and B.K. Swartz. "Evidence for Pre-Columbian Animal Domestication in the New World" Lambda Alpha Journal 21:34-46. ^ For example, Enos in the Book of Mormon tells that the Nephites raised "flocks of all manner of cattle of every kind": Enos 1:21, see also 2 Nephi 17:25. ^ 1 Nephi 18:25, Mosiah 2:3, 3 Nephi 28:22. ^ 1 Nephi 18:25, Enos 1:21, Ether 9:18. ^ "mountain goat". www.env.gov.yk.ca. Retrieved 2018-03-16. ^ Matthew Roper. "Deer as "Goat" and Pre-Columbian Domesticate - Matthew Roper - Insights - Volume 26 - Issue 6". Farms.byu.edu. Retrieved 2012-06-11. ^ "A History of Dogs in the Early Americas". www.nytimes.com. ^ John J. Mayer and I Lehr Brisbin, Jr. Wild Pigs in the United States: Their History, Comparative Morphology, and Current Status (1991, University of Georgia Press). ^ Gongora, J., and C. Moran. 2005. "Nuclear and mitochondrial evolutionary analyses of Collared, White-lipped, and Chacoan peccaries (Tayassuidae)." Molecular Phylogenetics and Evolution; 34: 181–89. ^ S.v. "peccary", The New Columbia Encyclopedia. ^ "Barley and Wheat in the Book Mormon". Featured Papers. Archived from the original on 23 February 2007. Retrieved 2007-01-19. ^ Barley and Wheat in the Book Mormon, Robert R. Bennett Provo, Utah: Maxwell Institute. ^ Robert R. Bennett, "Barley and Wheat in the Book Mormon", Provo, Utah: Maxwell Institute. ^ "Little Barley". Archived from the original on 2013-12-30. ^ "Fullscreen | Neal A. Maxwell Institute for Religious Scholarship". Publications.maxwellinstitute.byu.edu. Retrieved 2015-05-06. ^ Wissler, Clark. The American Indian. pp. 32–39 - as quoted by B. H. Roberts, Studies of the Book of Mormon, Second Edition, Signature Books, Salt Lake City, Utah, 1992, pg. 99. ^ Phillips, Charles; Jones, David M (2005). Aztec & Maya: Life in an Ancient Civilization. London: Hermes House. p. 65. ^ Holmes, W. H. Handbook of Aboriginal American Antiquities. 1919. p. 20 - as quoted by B. H. Roberts, Studies of the Book of Mormon, Second Edition, Signature Books, Salt Lake City, 1992, pg. 100 (emphasis in original). ^ Alma 1:29, Alma 4:6, Ether 9:17, Ether 10:24. ^ Sorenson, John L. (2013). Mormon's Codex. Salt Lake City, Utah: Deseret Book. pp. 346–347. ^ Sorenson, John L (March 1995). "A New Evaluation of the Smithsonian Institution "Statement regarding the Book of Mormon"". Neal A. Maxwell Institute for Religious Scholarship. Retrieved 2018-09-03. ^ Hogue, Charles Leonard (1993). Latin American insects and entomology. Berkeley: University of California Press. p. 328. ISBN 978-0520078499. OCLC 25164105. ^ Brown, Thomas (1832). The Book of Butterflies, Sphinxes, and Moths: Illustrated by Ninety-six Engravings Coloured After Nature. Whittaker, Treacher. pp. 65–66. ^ Gervais, Timothy; et al. (Sep 30, 2018). ""By Small Means": Rethinking the Liahona". Interpreter. 30: 207-232. Retrieved 2019-03-30. ^ "A Brief History of Glass". Archived from the original on 2011-10-24. ^ "Book of Mormon/Windows - FairMormon". www.fairmormon.org. Retrieved 2017-10-11. ^ Webster, Noah. "Dross". Webster's Dictionary 1828. Retrieved 2019-03-28. ^ "Hematite Mining in the Ancient Americas: Mina Primavera, A 2,000 Year Old Peruvian Mine". Retrieved 2012-10-03. ^ "Archaeologist 'Strikes Gold' With Finds Of Ancient Nasca Iron Ore Mine In Peru". ScienceDaily. Purdue University. 29 January 2008. Retrieved 1 June 2012. ^ "Steel in the Book of Mormon - FairMormon". ^ "STEEL". www.kingjamesbibleonline.org. Retrieved 2017-07-27. ^ "Question: Are all swords mentioned in the Book of Mormon made of metal?". FairMormon. Retrieved 23 November 2018. ^ "e-conservation magazine - The Appearance of "Bronze Disease"". 2012-09-17. Retrieved 2018-11-23. ^ Roper, Matthew (1999). "Swords and "Cimeters" in the Book of Mormon". Journal of Book of Mormon Studies. 8 (1): 34–43. Archived from the original on 8 December 2006. Retrieved 2007-01-11. "Spaniards who faced native Mesoamerican swords in battle were deeply impressed by their deadly cutting power and razorlike sharpness." "The first Andean evidence for metallurgy dates to around 1500 B.C. " site: http://findarticles.com/p/articles/mi_qa5348/is_199905/ai_n21438921 it is in the middle of the page. D. Hosler and G. Stresser Pean, "The Huastec Region: A Second Locus for the Production of Bronze Alloys in Ancient Mesoamerica," Science, 257 (1992), pp. 1215-1220. D. Hosler and Andrew MacFarlane, "Copper Sources, Metal Production and Metals Trade in Late Post-Classic Mesoamerica," Science, 273, (1996), pp. 1819-1824. R. Brill and J. Wampler,"Isotope Studies ofAncient Lead," American of Archaeoloe, 71 (1967), p. 63. D. Hosler, "Six Metal Production Sites in the Tierra Caliente of Guerrero" (unpublished research). ^ "The Maya Archaeometallurgy Project at Lamanai". ^ B. H. Roberts noted: "The word [cimiter] is of oriental and uncertain origin and appears in various forms. How it came to be introduced into the speech and writings of the Nephites, and how not used in the other Hebrew literature at an earlier date, is so far as I know, unaccountable. The earliest use of the word I have found is in Gibbon, where referring to the alleged incident of finding the sword of Mars for Attila, he there calls that sword of Mars "cimiter"; but that was about 450 A.D." - from Roberts, B.H. ; Studies of the Book of Mormon; Signature Books; Salt Lake City, Utah; 2nd edition; 1992; p. 112. ^ "Alma 11". Scriptures.lds.org. 2012-02-21. Retrieved 2012-06-11. ^ Coe 2002, p. 132 "[W]ell into Colonial times the beans served as a form of money in regional markets." ^ "Hebrew and Native American languages". ^ The word "Christ" is used 99 times, and the word "Messiah" is used 13 times. ^ "Messiah". JewishEncyclopedia.com. Retrieved 2012-06-11. ^ "BibleGateway.com: A searchable online Bible in over 50 versions and 35 languages". Bible Gateway. Retrieved 1 June 2012. ^ Packham, Richard (April 20, 2003). "A Linguist Looks at Mormonism". ^ "Book of Mormon Anachronisms: Pre-Christian Christianity". Retrieved November 7, 2013. ^ Ricks, Stephen D. (October 1992). "The name of one of the Lord's disciples listed in 3 Nephi 19:4﻿—Timothy﻿—seems to be Greek in origin. Is there an explanation for the appearance of a Greek name in the Book of Mormon?". Ensign. 22 (10): 53–54. Retrieved 3 April 2019. ^ Beckwith, Francis (2002). The New Mormon Challenge. Zondervan. pp. 367–396. ISBN 978-0-310-23194-3. ^ Cowan, Marvin (1997). Mormon Claims Answered. ^ "Sam". The Book of Mormon Onomasticon. Retrieved April 3, 2019. ^ Webster, Noah. "Adieu". Webster's Dictionary 1828. Retrieved 2019-03-28. ^ "Isaiah 13:21 But desert creatures will lie there, jackals will fill her houses; there the owls will dwell, and there the wild goats will leap about". Bible.cc. Retrieved 2012-06-11. Abanes, Richard (2003). One Nation Under Gods: A History of the Mormon Church. Thunder's Mouth Press. ISBN 978-1-56858-283-2. Roberts, B. H., ed. (1902). History of the Church of Jesus Christ of Latter-day Saints. 1. Salt Lake City, Utah: Deseret News. .
Tanner, Jerald and Sandra (1979). The Changing World of Mormonism. Moody Press. ISBN 978-0-8024-1234-8. Tanner, Jerald and Sandra (1987). Mormonism - Shadow or Reality?. Utah Lighthouse Ministry. ISBN 978-99930-74-43-4.